Sony Cyber-shot DSC RX100 III sensor review: Better by design? Given the physically small size and high pixel density we were mightily impressed by the 1-inch type sensor in the original RX100 and the follow up, the RX100 II. So how does the new RX100 III compare? Read on to find out. Canon has completely revamped their large sensor G1X compact. Read on to find out if this is enough to compete with rival offerings. 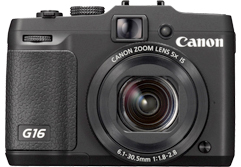 Following our sensor review of the new Canon PowerShot G16, we were curious to analyze the performance of the stabilized 5x optical zoom. As the equivalent to a 28-140 mm f1.8-2.8, it’s a high-speed model using all of Canon’s optical know-how. Read on to see how well it performed using our stringent tests. Canon has revamped the exterior and bolstered the spec, but while the firm hasn’t announced any enhancements to the new G16 model’s sensor, we were intrigued to see if any improvements to image quality had been made. Read on to see how well it performed. When the Canon PowerShot G16 was announced recently there was a general sense of mild anticlimax, both on the part of the journalists assembled at Canon's HQ in Long Island, and among some of our readers here at dpreview.com. To a casual glance the G16 might look like 'just' a G15 with a new processor, tweaked movie settings and Wi-Fi, making it a decidedly iterative upgrade.